Single earring. 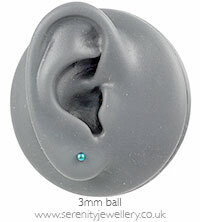 Hypoallergenic Ti2 titanium 3mm and 5mm ball stud earrings with titanium butterfly backs. 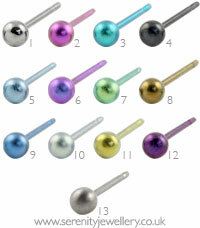 These studs are hand turned from a solid titanium bar so there is no join between the post and the ball. If you have very good eyesight or use magnifying glass you can see the word TITANIUM etched in tiny writing on the back of the ball. The plain polish and black earrings are shiny. 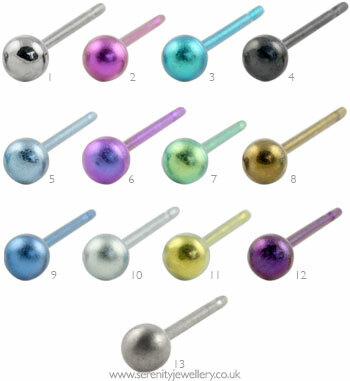 All the other colours have a satin/matt finish. Only earrings I can wear in my upper ear without pain. And they look good too!